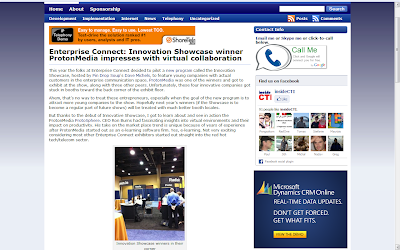 This week we had the honor of exhibiting at the Innovation Showcase at Enterprise Connect 2011. I had a great chat with Eugene Liu, a telecom independent contractor and editor of insideCTI. 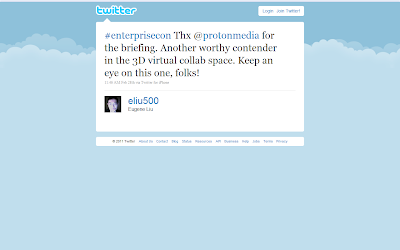 After I showed him ProtoSphere, Eugene spouted off a tweet with his reaction. Back at home base after the show, Eugene shared his thoughts on ProtoSphere on his blog, writing that "ProtonMedia impresses with virtual collaboration." Swing over to Eugene's post to find out why. Thanks for the kudos, dude.